WE OFFER PROFESSIONAL SERVICES FROM A LOVING STAFF. How does my child get started? Why choose Special Kids for my child's therapy? Please contact us if you have any questions about how our therapy & nursing services may help your child. Physical Therapy strives to enhance or restore a child’s functional ability through developing the child’s gross motor skills. 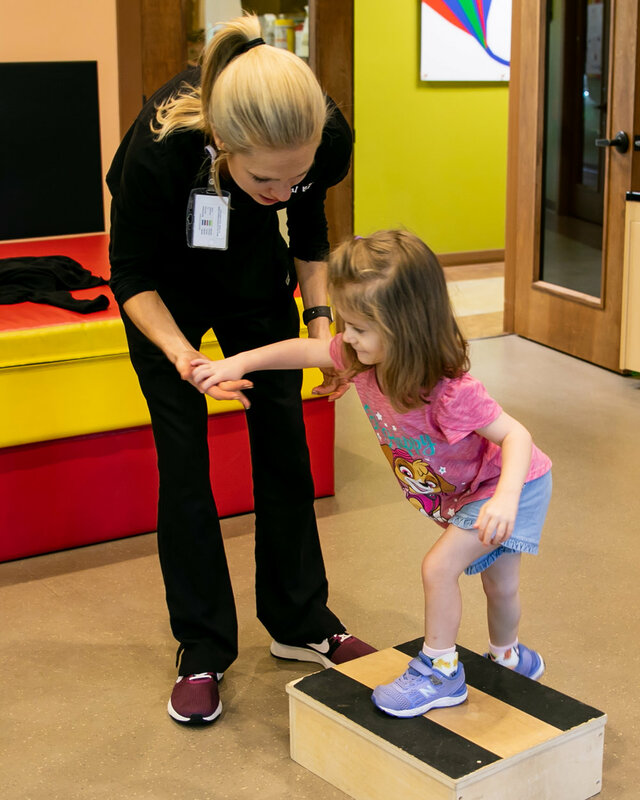 To put that in terms you can tell your friends, our physical therapy team is working to develop the skills each child needs to reach their greatest mobility, whatever that means for each child. How do we help a child reach their greatest mobility? To sum it up- it’s movement, strength, and balance. Does your child have trouble sitting up? Are they not standing or reaching for objects on their own? Are they not walking independently? These are just a few areas that physical therapists at Special Kids address. Our therapy staffs work with our families to encourage their child to participate in daily activities and routines. We want to see the child take what they are learning in our gyms back to their homes and schools. Our staff has extensive education and training on how to observe and evaluate a child’s mobility. We may recommend bracing/orthotics, wheelchairs and seating, or other up-to-date adaptive equipment. Treatment may also include the use of Cascade DAFOs, a line of customized orthotics, that our staff is trained in casting for, fitting, and modifying to meet a variety of children’s needs. After an initial evaluation, our staff will recommend a treatment plan that is customized for each child and their specific needs. Once beginning therapy, you will notice our treatment motto firsthand- play is a child's work. We use lots of toys, bubbles, music, and fun activities to motivate children to reach their goals while playing. Why choose Special Kids for Physical Therapy? Please contact us if you have any questions about how physical therapy may help your child. Occupational Therapy helps children to learn the skills of living. This means any activity a child needs to be able to do in daily life- from self-care, to handwriting, to zipping a zipper. Some children need help to learn basic skills that other children learn easily such as playing with a toy appropriately. Many of the children we serve in occupational therapy have difficulty processing the input that they receive from their senses and the environment. This can play out through a sensitivity to light, sound, or touch to name a few or through transitioning from one setting or activity to the next. Our occupational therapists help children learn needed skills, be more independent, and function more effectively in their daily lives. During our occupational therapy sessions, children do activities that help to learn the skills they need by breaking bigger tasks into smaller pieces. We strive to have the kids work on things in as fun a way as possible! After an initial evaluation, our staff will recommend a treatment plan that is customized for each child and their specific needs. Once beginning therapy, you will notice our treatment motto firsthand- play is a child's work. We use lots of toys, bubbles, music, and fun activities to motivate children to reach their goals while playing. Why choose Special Kids for Occupational Therapy? Read the "What is Occupational Therapy at Special Kids?" blog article now! Please contact us if you have any questions about how occupational therapy may help your child. Speech therapy (or technically Speech Language Pathology) works to improve a child's understanding of language and their expression of thoughts and feelings. This therapy works with all of the cognitive aspects of communication, speech, and language. When we think of speech therapy, most often 'r' and 's' sounds come to mind. At Special Kids, our speech therapists address everything from these issues to limited vocabulary to not speaking at all. Speech therapy helps children acquire the full range of human communication- or maximum communication as we like to say. How do we help children reach maximum communication? Speech therapy focuses on three main areas: comprehension, expression, and articulation. This therapy helps children with the comprehension of both verbal and non-verbal language in understanding that people, places, and things have names as well as more complex language such as spoken directions, inferred meanings, and humor. (It's true. Some of our speech therapists specialize in humor!) Speech therapy also works on expressive communication through words, signs, pictures, or a communication device with the goals of communicating basic wants and needs and being understood. Lastly, this therapy helps with the articulation of speech which focuses on the sounds rather than the content. This form of speech therapy helps a child learn the sounds of the English language so that others can more easily understand. Why choose Special Kids for speech therapy? Please contact us if you have any questions about how speech therapy may help your child. Feeding therapy seeks to address the causes feeding difficulties. This therapy serves children with food aversions, swallowing disorders, oral motor deficits, and delayed feeding development that can result in a lack of nutritional nourishment. A variety of diagnoses may contribute to weakness or in-coordination of the structures used in swallowing or feeding. Also, feeding aversions may range from being a little picky to extreme aversions that lead to a child refusing most foods and not being able to maintain proper nourishment. This therapy focuses on presenting new foods in a systematic and non-threatening way. 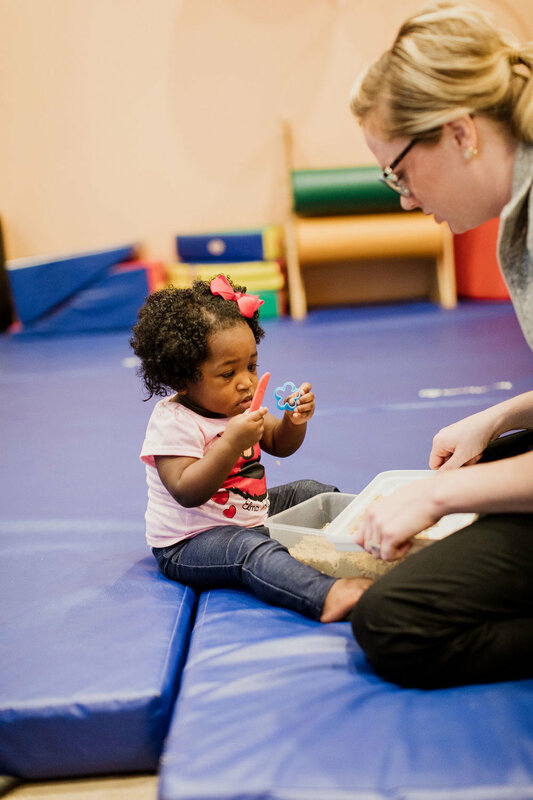 Special Kids has both speech and occupational therapists that are trained in providing results and evidence-based feeding therapy. Does my child need feeding therapy? Why choose Special Kids for feeding therapy? Please contact us if you have any questions about how feeding therapy may help your child. Group therapy allows children to learn and practice skills with their peers in a safe and controlled environment. This is especially beneficial because children often learn skills in a therapy room but have difficulty performing those skills with other people or in outside settings. Group therapy allows children the opportunity to generalize skills learned in therapy with a variety of people, which in turn encourages mastery of skills. Within a group, children can experience emotional support, understanding, and encouragement from one another. Social Language/ Pragmatic- Facilitates social interactions amongst children to enhance each child's ability to initiate, respond, and maintain conversation with peers as well as create friendships. Feeding- Provides a social model of desired behavior when eating. Parents may observe the session and receive education on therapy strategies to use at home. Stuttering- Provides emotional support while learning strategies to modify stuttering and enhance fluent speech. Skills are practiced with a peer to promote the carry over and mastery of skills. Parents are encouraged to participate. Handwriting- provides children with the opportunity to learn and practice letter and sentence formation alongside their peers in a fun and supportive environment. Preschool Language- Engages young children in group play based activities to improve receptive and expressive language skills. Read how groups are helping these kids grow. Why choose Special Kids for Group Therapy? Nursing services (or Pediatric Prescribed Skilled Nursing) is a program offered to children who are deemed medically fragile by a physician and require nursing care. Our unique service provides families with a safe, loving environment for their child to receive medical care during daytime hours. Nursing services also provides recreational therapy to each patient and offers each child the opportunity to receive physical, speech, occupational, and feeding therapies, as needed, while at Special Kids. Our nursing patients are also included in a peer-modeling program and a nutrition program to help them with their developmental needs. Special Kids' team of registered nurses and licensed practical nurses work to provide the best care possible for each child. The nursing program operates under the supervision of a pediatrician who is familiar with each child and their diagnosis. This list is not comprehensive as a variety of diagnoses can qualify a child for nursing services. Learn more about Recreational Therapy. Learn more about Peer-Modeling (EQUIP). Learn more about our Nutrition program. Please contact us if you have any questions about how nursing services may help your child. Camp Ability of Special Kids is a Christian, summer day camp for children and youth with special needs ages 6-25. To put Camp Ability in one word- awesome! This seven-week day camp is held during the months of June and July each year with the focus on Jesus Christ and serving each camper. Camp is designed to allow children with special needs to participate in an interactive, social, and just plain fun environment. Our caring camp counselor staff emphasize children's abilities rather than disabilities and find ways for all campers to participate in activities. Camp Ability is held at North Boulevard Church of Christ in Murfreesboro, TN, and is broken into two sessions- one in June and one in July. Campers are able to attend one or both sessions depending on a family's preference. To make activities fun for everyone, campers are divided into groups of about 8-12 campers based on age groups. At Camp Ability, our children's safety comes first, so we have one lead counselor and two or more support counselors in each group (giving us a ratio of one counselor to every three campers). A full time nurse is also on site, and volunteers participate in camper groups when needed with more involved activities. Family Resources exists to serve the whole family of each child at Special Kids through providing needed resources and opportunities for growth and healing. Our family resources staff are the first people a family meets when starting services at Special Kids. Family Resources makes Special Kids unique. We are more than a center that provides therapy or nursing for the children. We are a ministry here to serve the family as a whole. Family Resources reaches out to Special Kids families through offering the Cornelius Christmas program each December, organizing meals throughout the year, and providing benevolence for families in need. We strive to get to know and come along side of our families so that we can be a support system for the needs that extend beyond our therapy and nursing care. We desire to be a connecting point for families of children with special needs to other resources in the community. Family Resources refers patient families to outside help that may provide financial grants, food, clothing, counseling, and other types of assistance. We also provide information for families navigating the world of special education services. Family Resources helps families begin services at Special Kids as well as provides them with ongoing educational opportunities. We strive to empower families to learn to advocate for their children and provide for their needs. We offer education through individual family meetings as well as special classes focusing on nutritional training and parenting support. Learn about upcoming educational classes on our events page. How do I get connected with Family Resources? Please contact us if you have any questions about how family resources might help your family.